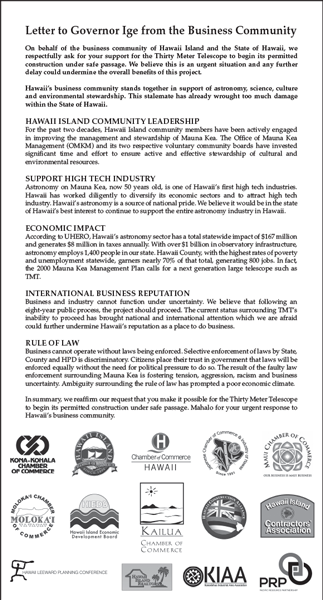 Hawaii’s business community support TMT because of the many benefits it will bring to Hawaii Island, the state and its people, including the creation of high-tech jobs, economic impact, furthering international business relationships, and continued stewardship of Maunakea. High school and college students across the Islands have demonstrated their desire to see TMT move forward. TMT provides them the opportunity to pursue their dreams here at home. 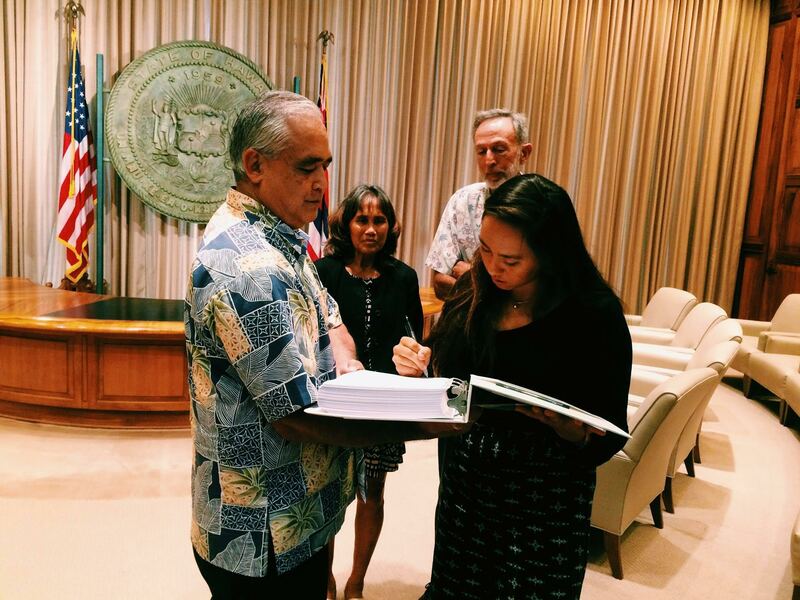 Pictured to the left is Mailani Neil, a native Hawaiian and recent Kamehameha Schools graduate, presenting her petition in support of TMT to Mike McCartney, who represents Governor David Ige. What do you think about Wednesday’s protest against the Thirty Meter Telescope held at UH Manoa? PUEO (Perpetuating Unique Educational Opportunities) – this group is based on Hawaii Island and believes that Hawaiian culture, science and technology can work together to build a future for Native Hawaiians and all Hawaii residents. Chad Kalepa Baybayan, captain and navigator of the Hawaiian voyaging canoes Hokulea, Hawaiiloa and Hokualakai – testified earlier this month at the contested case hearings in support of the TMT project. Baybayan said the Thirty Meter Telescope and the astronomers of today are a natural extension of the ancient Hawaiians who studied the stars while navigating across the Pacific Ocean. 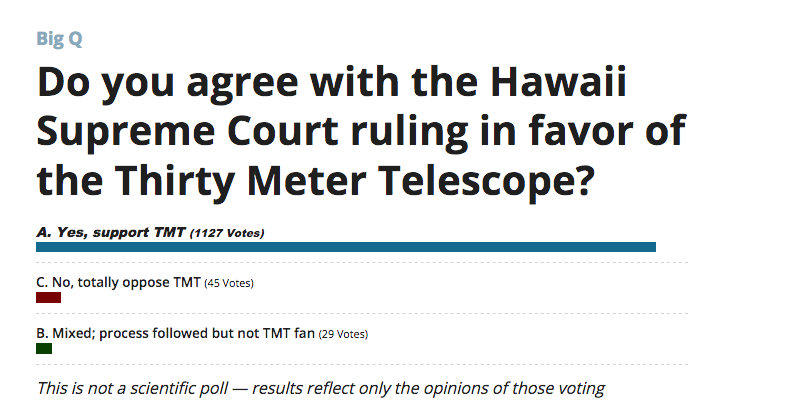 In addition, a scientific poll conducted earlier this year on Hawaii Island found that support for TMT’s construction is split among Hawaiians/part Hawaiians on Hawaii Island, with 46 percent of those polled in support of the project and 45 percent opposed. Eighty-nine percent of all residents also agreed there should be a way for science and Hawaiian culture to co-exist on Maunakea. A scientific poll taken this summer showed an overwhelming majority of Hawaii Island residents believe that astronomy observatories/facilities and Hawaiian cultural practices can take place concurrently on Maunakea. Meeting with Native Hawaiians to gather their feedback on the planned telescope’s design and location to minimize potential impacts. Locating the planned telescope a reasonable distance away from traditional cultural practice areas on the mountain, with the facility being at least one mile away from the nearest religious site. 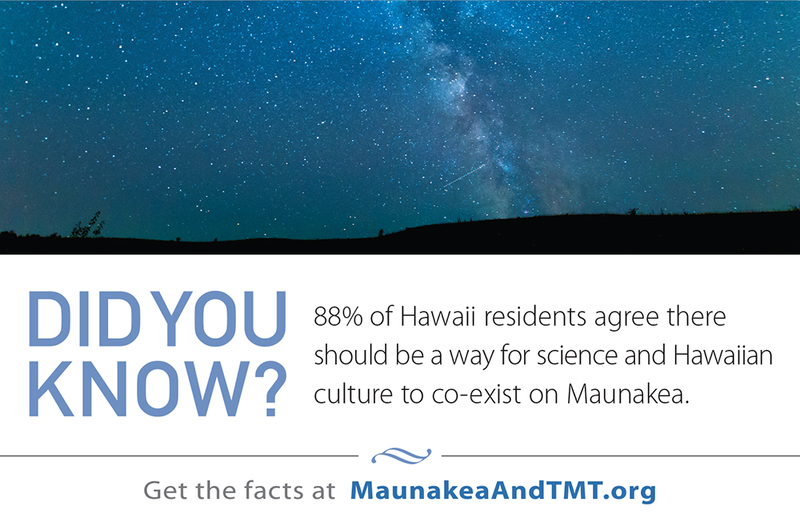 Scheduling TMT observatory operations to minimize daytime activities up to four days annually in observance of Native Hawaiian cultural practices. 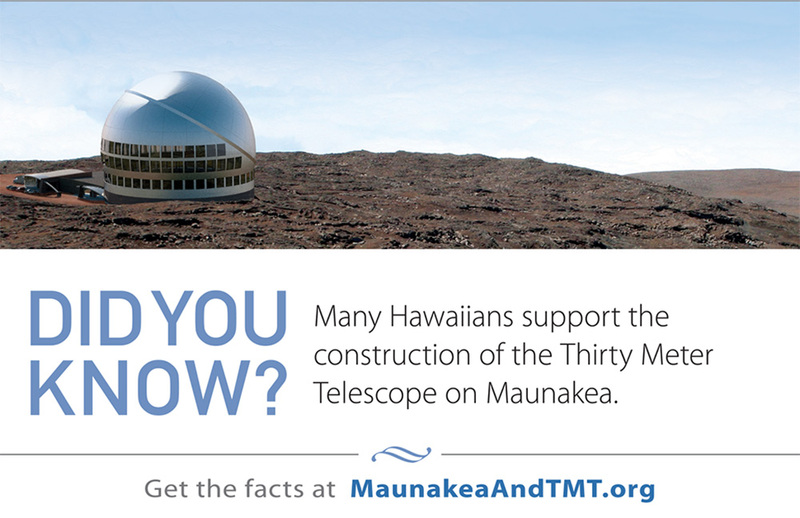 TMT will work with the Office of Mauna Kea Management and Kahu Ku Mauna to determine days for such observances. Alexis Acohio and Kristin Kahaloa speak about pursuing passions and dreams in Hawaii. Scott chats with Mailani Neal at the TMT Mahalo event about what motivated her into getting into astronomy. Scott speaks to Dwayne Mukai at the TMT Mahalo event about the history of astronomy industry on Hawaii Island. Scott speaks to Jacqui Hoover, Executive Director of the Hawaii Island Economic Development Board at the TMT Mahalo event a few weeks ago.